Nathan Collins (right) with assistant Nick Chapman. 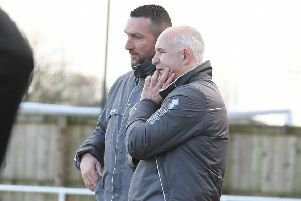 Following defeats to Hallam and Nostell Miners Welfare in the past week, Nathan Collins’s side will be keen to get back to picking up the results that will ensure their safety in the Northern Counties East League Division One. The Lilywhites currently sit 15th in the table, five points clear of the drop zone, although all five sides below them have games in hand. And while Skegness are in the favourable position of having points on the board, they will be looking to pull themselves further away from danger as swiftly as possible in their three remaining fixtures. Shirebrook are currently 16th, a place and two points behind the seasiders. They arrive at the Vertigo Stadium on the back of six straight defeats, and have picked up just one point in their past nine league fixtures.